Edward Njui has endured much to become owner of a small digital music recording studios in Nairobi. The challenges are many but his dream is big. A real life story. Mention River Road and memories of Sony, PolyGram and other international music recording companies that ruled the industry in the sixties and seventies come flooding in the mind. The wave brings in the likes of Fadhili Williams, Steve Beautah, Daudi Kabaka, Joseph Kamaru and many others who made their dreams in studios along this down town street in Nairobi. Exit of these international labels saw emergence of many smaller studios that scrambled to fit in the big shoes of their giant predecessors. These too did a commendable job of bringing local artistes to the lime light, and now River Road is witnessing a third reincarnation - emergence of much smaller but more efficient digital recording studios. Among the latest entrants in this arena is Agape Studios, a venture owned by Edward Njui. Agape Studios is located on the second floor of Simba Centre along River Road. On a first visit to the building, you doubt how such high levels of sound precisions as those produced by Agape Studios can indeed come from such a noisy block. I too could not understand, until I was informed that the very people recording in the studios nearby were the owners of the music blaring from competing music shops outside. It came not as a surprise too that some of the shops indeed belong to the musicians. Certainly, many artistes have made it in life doing this sort of business. But as some veterans will tell you, ability to choose what you want to hear and block out the rest of the noise is a rare gift that you must have if you hope to succeed at River Road. Agape Studios, like many other businesses along this street, isn't for the faint hearted. To access it, you must leave your pride and biases outside the building, take the stairs to the second floor and walk straight to the far end of the corridor. Turn left and there at the end of a short corridor you will find a wooden stairway. If it inclines vertically at an angle close to 90 degrees, then it is the right one. Climb right up! To the left you will find a heaven where angels sing their hearts out in melodies that could make you cry. It is hard for a casual observer to see that the humility of the studio's setup covers up a big dream in its founder's mind. Just recently were the walls of the two rooms that house the voice room and the reception painted in a cool shade of purple. A matching PVC carpet has also been rolled out on the floor. And as usual, clients wait patiently on a one-metre-long wooden bench for their chance to record. This noticeable limitation in space has its lovely side too. As the artistes wait for their turn to be served, they discuss freely their experiences with other studios in town. They joke and laugh at their past mistakes in the music business, and gladly share lessons that no music school can teach. Another benefit of this set up is that unlike in high tech studios where things are done behind closed doors, at Agape, Njui does the mixing and mastering of each record as the audience on the bench watches and listens. With everyone attentive and commenting on the effect that each tweaking of the knob adds to the mix, even the most inexperienced of the artistes can rely on the social guarantee of sound quality that is provided free of charge by the jury sitting on the bench. Mr. Njui's journey to owning a recording studio in the city has been characterised by passion and patient persistence. In a jovial mood and occasionally holding his chin, he recalls the sequence of events four years ago. Back in 2002, he had just recorded his first gospel album titled Ndikuraririra, (I won't spend a night here, am on a journey). Each song on the record was a masterpiece in its own rights, and he had taken years to compose and write the songs. The cost of hiring guitarists, drummers, a keyboardist and other instrumentalists was going to be prohibitive, and so he had opted for a cheaper option that was also guaranteed to give better sound quality. He paid to have all his 12 songs programmed on a keyboard and stored in a diskette. This is what was played back during the recording session in studio. Although the quality of instruments was superb in all the songs, the quality of human voices got subdued as the record proceeded from one song to the other. In the end, although the lead song got a lot of air play on FM radios, the record wasn't as successful as he had hoped. After repeating the project at a different River Road studio and getting the same poor results, Njui learnt that there is a great difference between analogue recording (what he had been doing) and digital recording. In analogue recording, which is cheaper, all the voices and instruments are picked written together onto a chrome or Digital Audio Tape (DAT). Should a singer go off pitch or an instrumentalist hit a wrong cord, the song has to be done again from the beginning. In digital recording however, each voice is picked and stored as an independent track in a computer's hard disk. From here, a voice can be edited and off pitch sessions punched in. The sound can also be equalized independently, levels of noise reduced, and quality enhanced by adding various digital sound effects before being combined with other voices and instrument sounds to make a song. The level of clarity of sound and the overall quality of the final product made in this way is far higher than that produced through the analogue method. "That's when the idea came to me that if had a computer; I could do digital recording in the comfort of my home." Working at home would also reduce the inconvenience of having to transport his team to Nairobi and back for recording sessions. Unfortunately, just as he was planning to take this bold step, his job as a painter hit the rock bottom and he was once again living from hand to mouth. "For quite some time in 2003, music took a back seat and fighting to keep my family afloat took priority. Jobs were scarce and the few that came by weren't paying well." This went on until some time in 2004 when he got some Ksh. 300 to spare. With this, he bought a computer mouse. "Buying a PC as a whole unit was out of question by now, and so buying it in parts seemed the closest way to owning one. Given my little understanding of IT, I thought the mouse was the most important part of a computer and buying one was thus a huge milestone. Soon, I was to realise that a mouse actually went for half that price." Njui's second milestone was buying a keyboard, which was sold to him at Ksh. 600, once again double the retail price. This offset the family budget for some time but he was determined to achieve his dreams no matter what. He later bought the other components one at a time as months passed by, and finally got a friend to assemble the unit for him. From that point on, things started taking shape. People started getting interested in Njui's home studio, and he at one time had to rent a room at Gachororo in Juja where he set up his first commercial studio in 2005. Since then, Njui has come a long way. When he got a room at Simba Centre towards the end of last year, he seized the challenge to launch himself in the city. Here, he found that artistes were keen on sound quality but he was up to the task. Cash constraints dictated that he had to start off with humble pieces of equipment, though his understanding of music software compensated for the shortfall. With time, Njui has been upgrading his tools of trade. Today, brands such as Denon amplifiers and Oxygen MIDI keyboards aren't alien to the venture. Agape Studios also boast of a top of the range microphone with shield - the envy of many small studios in the city. Backed by Ken Njau, a music guru who can sequence virtually any style of music, it is all systems go at Agape Studios. Artistes stream there one at a time, attracted by the high quality of productions that come from the studio. Despite the apparent congestion in the local gospel music field, Agape's productions are gradually curving a niche for themselves in Kenyan airwaves. One of the studio's most successful artistes is Peterson Njenga of Shiringi ya Nga (The Female Shilling) fame. Notably, Ben Githae, a veteran Gospel artiste, did Chumvi, one of his latest hits, at the studio. There is much that Njui, 31 and a father of two boys, wishes to do with his studio in the turning of time. First, his music is still in his computer's hard disk and he intends to release an album soon. This time round he intends to do a better job than he did before, now that he has the necessary facilities and at no cost. As the business expands, Njui would also wish to create employment for more sound engineers, and assist other talented artistes who might not afford to hire a studio. This he talks of with much certainty. "It's God who has brought me this far. I know He will lift me higher from these humble beginnings." He prays that it won't be long before Agape becomes the greatest studio in town. Despite the roughness of life at River Road, Njui soldiers on towards his dream. As a born again Christian, he knows that God won't let him down. In all this, Njui looks to his wife, Nancy, with much dignity and admiration for having stood with him through the many storms that life has tossed their way. 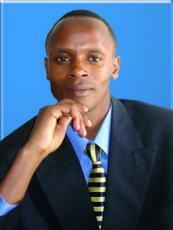 First pubhlished in the July 2007 issue of the Small Medium Entreprises Today magazine, Nairobi, Kenya. © Copyright 2019 John Wanjora. All rights reserved. Thanx so much Zephyrmail, glad to hear from you first thing this Monday morning. You've put a smile on my face. Sure, as you say, artistes come from far and have to endure much. Most of them want to become overnight celebs, but I believe only hard work can give them the much needed discipline to withstand fame and fortune should it ever come their way. This guy really inspires me the size of his studio not withstanding. Lovly day, God bless and take care. This page was created in 0.8833 seconds.